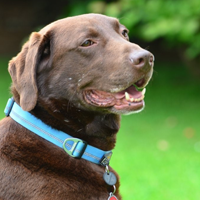 Sam is a 7 year-old Chocolate Labrador and has been coming to work in Nixon & Co. since he was a puppy. He has his own bed and water bowl behind Meg’s desk. If you hear snoring while you’re on a phone call with Meg, just remember that it’s only Sam! If you’re not a dog lover, don’t worry. Sam is quite happy to go and have a nap in another room while you have your appointment with Meg. If you are interested in our services, please leave us a message in the form below and we will get back to you as soon as we can.